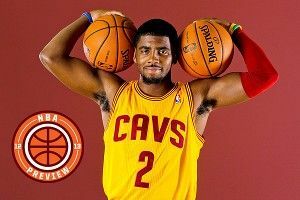 If you’re playing basketball in Cleveland, you should be the happiest player in the NBA. You should. For a decade, it was maroon, maroon, maroon — and what happened? You got marooned. It’s been two years since you-know-who left. It’s time for a new you, and here it is: French’s mustard with Heinz script. It’s young, it’s exciting, and when I see it I immediately want to put the whole thing on my hot dog. It’s only an alternate uniform, it’s true. But it’s one that says things are looking up: We’ve still got Kyrie Irving, and we just know he’ll be thrilled to spend many nights for many years wearing this and not totally ripping our hearts out. Right, Kyrie? The Knicks are hurting right now. I mean, they’re always hurting. Or maybe it’s that New York always hurts for them. But these tweaked uniforms are a terrific Band-Aid. The white brings out the complementary blue and orange (even on a compression sleeve!) while acknowledging a basic truth that’s often overlooked in the NBA: White’s a color, too. Meanwhile, the black detailing is gone entirely, presumably in a move to that other borough. It’s a small but major omission, like removing all the lines in a coloring book. Frankly, all the gorgeousness in the design culminates in the blue waistband (the blue uniforms have an orange band). It has the drama and flattery of certain belts — the great ones that let you forget they’re for support. Here it’s still a waistband, but it’s also handsome in a way that’s not often achieved even by the designers of some comic books — and they’re the designers of some of the greatest uniforms in the history of everything. The Knicks’ unveiling of them at an event inside a Hugo Boss store felt off. 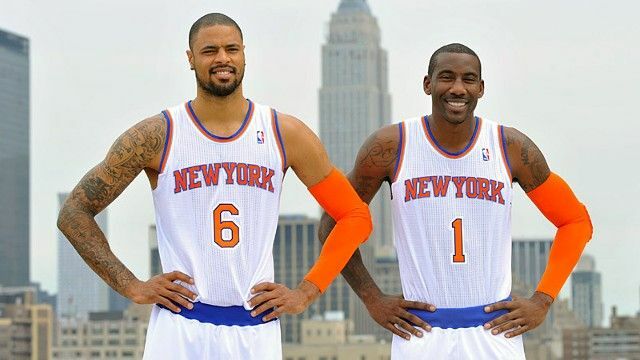 So did the photo shoot in which Amar’e Stoudemire and Tyson Chandler, both uniformed, stood on a roof with serious expressions and their hands on their hips. They looked like out-of-work superheroes waiting for cape delivery. Those pictures do make you worry that these clothes might not be street-ready. But who cares? They make you forget about the other troubles. Jeremy Lin might be playing in white for Houston, but that white isn’t nearly as beautiful as this. The old Trail Blazers logo, the classic one, the red-and-white pinwheel frozen in frantic mid-spin, is pure imagination. Could it be mistaken for the logo of some television producer’s production company or the fireball in certain Nintendo games? Yeah, sure. But that’s what legal’s for. In a move of pure anti-imagination, the top brass in Portland have, for the foreseeable future, ditched the whizzing pinwheel for stripes that dash across the lower half of the jersey. This is the wheel buckling down and applying itself. Sigh. The reds still pop, and the angling stripes are presented as such harmless and riskless (if totally clever) design that any player can feel confident wearing the alternate jersey. Until you realize one thing — and this couldn’t have been on purpose — the scheme of the colors is eerily similar to what the white girls wore in Bring It On. When Venus Williams won her third Wimbledon in 2005, there was a moment during the semifinal match against Maria Sharapova when I noticed something I hadn’t seen before: She was playing without any of her usual accoutrements. No earrings, no neckwear. There had been doubts about whether Williams had what it takes to win another major, whether she still believed in herself. The lack of finery and momentary embrace of no-frills style told both supporters and skeptics that she meant business and intended to win. That’s a long, long way of saying that I don’t like the Nets’ basic new uniforms — black and white; thin, discreet sans serif font; herringbone pattern for the stripe along the flank — but I understand. They’re not here for the sideshow. They’re not even here for big colors. So if some teams want to get cute with cabins in the mountains and complementary hues and Canadian Forces camouflage, let them: The Nets are leaving their earrings home and plan to win it all. Famously, Jay-Z is the team’s … everything, it appears. If his influence extends to attire, maybe he should delegate; maybe he should make Kanye West clothes commissioner. People are saying these uniforms are “classy.” People are saying they’re “classic.” I’m just saying I think Reasonable Doubt should stay an album cover. Of course, when the Nets go to San Antonio on December 31, Hova will seem like a genius (I know, I know, and I’m sorry: more like a genius). 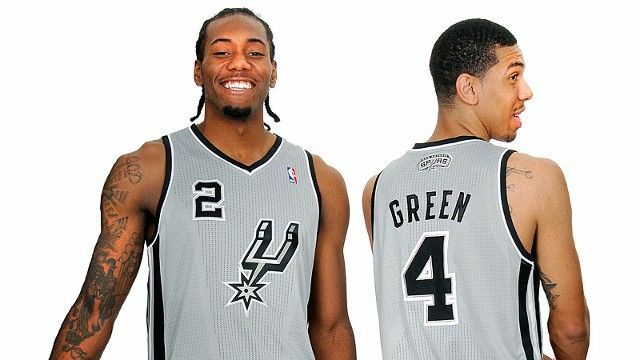 The Spurs are spending at least some of their year playing in complete overcast gray. Something you realize about these updated uniforms is that creating a flank stripe really is an art. Too wide or too many, and very tall men turn into stalks. That’s what these Spurs stripes do. 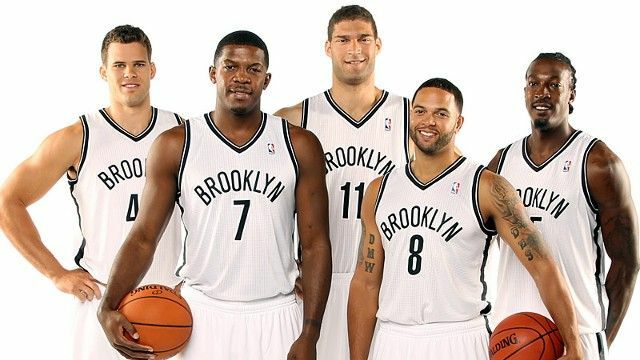 During that December 31 game, for instance, were I playing for Brooklyn I wouldn’t know whether to defeat the Spurs or donate my Christmas leftovers to them. The spur itself remains the uniform’s centerpiece. Relieved of its duty of playing the logo’s u, it can explore new opportunities. Now it looks more than ever like a magnet hurtling out of the sky in a Godzilla movie. As for the color, all you can do is pray that, pointswise, the team intends to make it rain. A lot. So, sure, it took the players a couple of beats to emerge, and when they did, they all looked sheepish. A gander at the uniforms cleared up why. 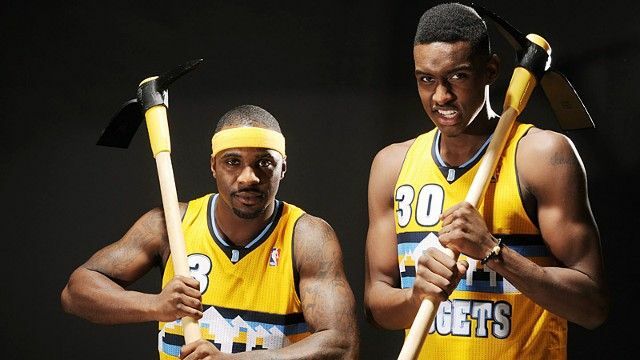 They were wearing banana yellow, with the Nuggets’ Columbine Blue waistband. The jerseys were printed with a row of cabins and the outline of a small staircase. The background includes black, blue, and yellow stripes, and, in the distance, the faintest dabs of Rocky Mountain. It’s panoramic and pro-development. On the old uniforms, the jerseys were blueish and the stripes were a real rainbow. I imagine a return of that exact uniform would have been taking the league’s “It gets better” campaign an inch too far. (Especially with those houses. Who’d be living there? Log Cabin Republicans, of course. Which obviously means that bears would be lurking in the nearby forest.) So, on that score, the team has opted for safety first. But even in these handsomely done overhauls, Danilo Gallinari looked skeptical, and JaVale McGee looked sour. That’s understandable. I think if you’re a Denver Nugget and have to play even one game in a yellow jersey that doesn’t say “Lakers,” you’re just kind of mad.